Last time we talked about the body in the classroom. Our body, my body, the bodies of my students, are all shaped by institutional bodies that carry values, marks, love, deceptions, commitments and history. Just as our bodies carry constructions of race, gender, sexuality and so on, so too do our institutional bodies carry these same constructions. And in addition, through their organizational structures and curriculum, our institutional bodies support specific discourses of identity, race and class as well. 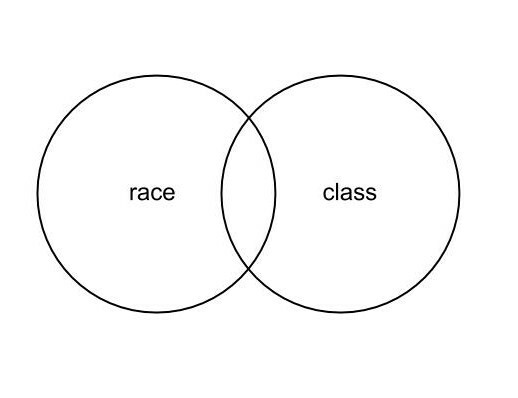 In the classroom we are always constructing or breaking these discourses, consciously or unconsciously framing forms of life, framing racial and class relations. Any syllabus is an x-ray of our understanding of these relations, and our open or hidden awareness of these constructions. The classes we teach, the ways we shape our conversations, and the forms of evaluation we demand fundamentally shape structures of relationality and power. Our forms of evaluation and grading of students clearly demonstrate our views. For example, under the proper name of higher education, we can easily dismiss certain students through analysis of their grammar and knowledge – as a way to keep our class membership and privileges, either by inheritance, inculcation or social movement. Classroom evaluation clearly exhibits teachers’ critical judgments: regarding race and class (those who do not have the form of education we had, or cannot sustain the proper identity or class, grammatical use, and ways of learning and thinking); regarding gender (those who do not subordinate to the male ways of thinking, respect and hierarchy); and regarding sexuality (those who do not comply with acceptable sexual norms or think in heterosexual ways). We who teach have the requirement to go through what Paulo Freire calls conscientization of our personal lives in more expanded and connected ways, so that we can connect to the worlds of our students. More specifically, we must engage in what bell hooks calls a “journey to class consciousness.” It is very frustrating when the journey into race consciousness ignores class consciousness, for then its analysis ends up lacking the economic aspects of what has developed the entirety of racial discourses. Race has been built on the back of economics and it is intrinsically related to class, economic developments and disparities. The combination of race and class clearly show up in in each of our students. Sometimes we can see it: when students are exhausted, both physically and emotionally because of certain battles only minorities and poor people go through; when students can’t do the readings, not because of laziness or lack of commitment to the class, but because they can’t find time in the midst of so many demands, jobs and responsibilities. Schools also have class commitments. I am always troubled when schools base the acceptance of applicants almost entirely on the students’ GPA. Schools love to describe themselves as having the students with the highest GPA and the most brilliant minds — but this is mostly because money comes with them, or they will pull the reputation of the school to places where money can be made. Some seminaries act like predatory for-profit colleges by encouraging and enabling ever greater student debt. In many ways schools are an arm of the economic neoliberal system. Usually high GPA students have had better conditions of life and better access to education and therefore could work on their grades. This education system keeps the structure of merit, instead of the rights of students to have full access to education no matter their grades. Moreover, it supports the middle and upper class ranks, divisions and separations– keeping the cycle of injustice and perpetuating class struggles. A just society would have schools that choose students by other measures and weights — beginning with those who could not make it, those who do not have good GPAs, those who would never be accepted anywhere. Because these students live at the bottom of the class pyramid and are marked by gaps of sustenance and lack of almost all conditions to access better forms of education and better life, they should be the first ones on the list of any school! They should be desired! The structure of schools should find funds to pay for their studies, to help them write, read and develop their voice and critical thinking. Thus, to talk education is to talk about the material conditions of our students, to talk about their race, sexuality and gender all wrapped up in class struggles. It is to pay attention to the material conditions of life, how people are, or are not, part of the social network, in what ways they are part of it, how they are related to the modes of production, and how much access they have to the richness of society. Education is one of the measures of the in/equality of society. It is an apparatus of society, for it holds the cultural social capital that can foster, challenge or break the inequality of a system by ways of making itself available, or not, to all. When accessed, the material condition of students will determine the conditions of the possibility of their engagement and eventful success in their education. For education is much more than a degree. It is a form of living! Knowledge that comes from farming, from the healing of our grandparents, from the kitchens of our mother and grandmothers, from the survival on the streets, from the stories and discourses of our communities, from other forms of relation to the environment. That is why we need to fight the way our societies compartmentalize education to certain places, buildings, classrooms books and moments of life only to recognize those who have educational rank, merit, titles and are able to do scholarship away from the daily life of people. A teacher had an undocumented student in class. The student couldn’t engage the class mostly because of the language and the ways of reasoning which were always a challenge to him. As he couldn’t engage, he distanced himself and withdrew from class participation, becoming only a listener. In the first major written work, he plagiarized. When the teacher recognized it, she was very aware that if she was to take him to the proper channels of the school, this student wouldn’t stand a chance and would most likely be kicked out. She decided to talk to him first and got to know him better. Through the conversation, she was able to hear all of the hardships the student was going through: no documents, working in extraneous jobs, wife caught by immigration and in a private jail and a child back in his country with his mother and meager sources to survive. How could he focus and think in ways that were new and scary to him? School was definitely not for him. However, instead of asking him to write another, proper, final paper, the teacher suggested that they write the paper together. It took her time, but she did it. It was a wonderful discovery for both of them. Taping into his strength, knowing a bit more of his world, this teacher made a choice to walk along with him until he was able to walk by himself. Empowered, against all the odds, he could, perhaps, have a chance to survive, to compete in this jungle, and to offer some resistance to these systems of injustice. She broke with a pattern, enabled him to become a true student, and by her own choice to become an attentive and true teacher. All footnotes quoted from bell hooks, Where We Stand: Class Matters (New York and London: Routlege, 2000).